No, cekodok is not my favourite food. This entry is not about cekodok the food, or cekodok recipe. It's about health management. Sorry to disappoint you. Hehe. Recently i've been obsessed with my weight. i changed the way i eat, what i eat, the timing of my snacks and meals, i workout. Don't get me wrong, i'm not on a strict diet. i'm just extra careful now. It was hard being a Malaysian you know. All those nasi lemak, char kuey teow, mee kari are IRRESISTABLE. And it's hard to track down how many calories there are in those foods. Not only that, the website has an application where we can actually plan our daily meal. 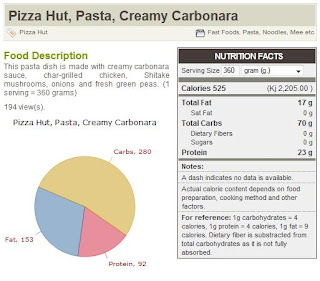 That way we can see what we will get out of that meal.Trust me, it'll make you lose appetite when you see how much calorie you put in your body every single day. 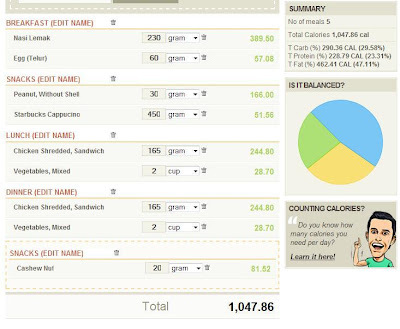 As an example, this is my meal today and how much calories i consumed. Clearly my meals don't have balanced nutritions. More fat than protein. It also teaches us to calculate our Basal Metabolic Rate (BMR) and Daily Calorie Requirement (DCR). These two alien things are calculated based on our weight, height and age. Thus, we can determine our calorie needs per day and makes us don't wanna eat. Though it doesn't have information on every single food on Earth, it can helps us improve the way we eat. i'm determined to watch what i eat, but at the same time still enjoy and indulge myself with sinful yummy things. Everything in moderation, bebeh! btw kau dah ok la beb. nak turunkan brapa kg lagi? heh...nak jadik lisa suri ke? wow..hehe..ko kan abang hensem..mesti la slalu kire calorie..
aku nak trunkan 6kg dow..body zaman uni dulu..adoi laaa.. This is Why i Hate The Scale..
Menjadi Orang Kuning Selama Seminggu!